What a fantastic hockey story! I loved Eric, the closeted enforcer, and he couldn’t be more perfectly or more improbably matched to Dorian, a flamboyant supermodel. I loved both of these men and their enormous extended families. I think I probably had more empathy for Dorian, the man who refused to be a closeted dirty secret, but beautiful bearish Eric had me weak at the knees. I loved Eric’s teammates and I enjoyed the glimpses of hockey and hockey life. There are some complicated ideas explored here. Maybe it isn’t the players or the sport being homophobic. Maybe it is just a general fear that keeps everyone closeted – and maybe that hurts the playing ability of closeted players. This is a sweet and potentially simple sports romance with surprisingly complex characters. The central relationship is also surprisingly mature. The story manages to be complicated without ever becoming angsty. It is beautifully written and I really enjoyed it. 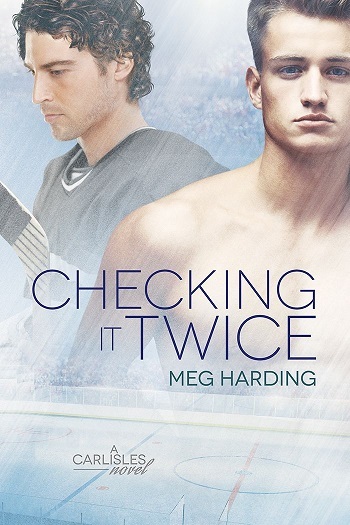 Reviewers on the Wicked Reads Review Team were provided a free copy of Checking It Twice (The Carlisles #3) by Meg Harding to read and review.